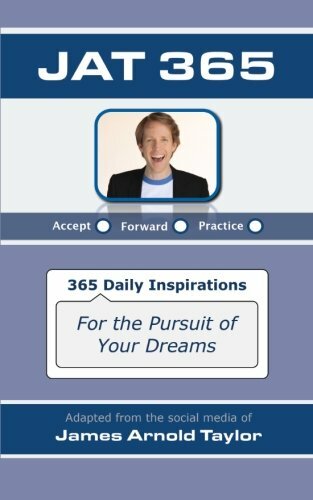 “Everyday is a new opportunity to do something that will bring you closer to your dreams!” - James Arnold Taylor Known to his fans as “JAT”, Actor and Ambassador of Inspiration, James Arnold Taylor now offers you 365 days of his positivity in this book adapted from the pages of his on-line social media accounts. With JAT 365 there’s no computer or smart phone required to pursue your daily goals and life long dreams! This simple, easy to read and use book allows anyone (of just about any age) to start the next 365 days with a positive thought, then challenge yourself to accept, forward and practice it, as well as journal your own impressions of it on every page along with James. You can achieve more in your life by daily applying positive thought patterns and disciplines. JAT 365 can be an excellent tool in your endeavor to conquer negativity by leaving little space in your mind to dwell on it. James is a firm believer in this from his own life experiences and wants to share his positivity with all who read this book. James Arnold Taylor is one of Hollywood’s most sought after and versatile Voice-Actors. Heard daily on TV, radio, internet, in video games, film and more. Known for his wide vocal range spanning characters from the likes of Johnny Test to Obi-Wan Kenobi, and Fred Flintstone, as well as a world wide motivational speaker and entertainer, James is devoted to lifting others and their potentials up.